Those of us who work with change networks could sometimes do a better job of clarifying the distinction between 'networking' and 'network weaving'. Leaving that distinction un-articulated and merely implied inclines those who are new to the discussion to default their hearing to the generic-mainstream meaning of 'networking'. It leaves much of what is important and different about network weaving either un-said, un-heard, mis-understood, or suspect. Now don't get me wrong - generic 'networking' is indisputably important. Contrasting something to it doesn't mean devaluing it. And in reality, there's a world of overlap. Either can merge into becoming the other. You could personally be doing one, in the context of the other. And what you think you're looking at depends on where you fit in the network. There isn’t a bright line. My pretense at precise distinction is merely for the sake of nudging us a little further along the spectrum of what's possible. Because - there's more power and potential in a social network than we've been taught & have grown accustomed to recognizing. And it's hard to access that 'more', if our words limit our imagination. So this is as much about what we're IMAGINING we're doing while we're doing it, as it is about precisely WHAT we're doing. For those of us who don't resonate to Harvey McKay's 'Swim With the Sharks' and that ilk - the default, mainstream meaning of 'networking' can be a big turn-off . We've come to understand it as a specific, often self-serving, not-necessarily-authentic, social butterflying kind of activity. To many of us 'networking' is a popularity contest - best left to smarmy salesmen, politicians, corporate CEOs & lobbyists. We get a little queasy just contemplating joining those ranks. And no amount of rosy pep-talk convinces us. For introverts and those who value authenticity ‘Networking’ fires up the wrong imaginings. But beyond being a potential turn-off, the common usage of the word falls short of the vision and purpose behind network weaving. 'Networking' tells the social butterflies they've arrived (an assessment the rest of us can’t agree with), while it leaves much of a network's deeper potential impact and generativity untapped. We need different words to signal that we're leaving the default meaning behind and talking about something more. And we have them, we just need to use them. A 'socio-network' is a 'network in a box'. It has clearly-defined, solid boundaries - such as “everyone who works at Company X”, “or everyone who goes to School A” - it only looks at the relationships existing within that boundary - no-one else is relevant. An 'open-network' is what it sounds like - there are no boundaries. The internet is an open network. Twitter is an open network, Facebook is an open network - anyone can open an account and anyone can be connected to anyone. There is no limit to who might be included in a network map of an open network. In theory, it includes the entire human race (or even further). An Ego-Network revolves around a core person - it is defined by direct relationships to that central person and doesn't include indirect (2nd degree) relationships or persons unknown to the core person. Sounds a lot like what we get from 'networking', right? It's all about 'me'. In our society, an ego network is generally connected around support of the core person in some way - important career contacts; the politicians a lobbyist cultivates; the network of family, friends and caregivers around someone with a severe illness, or something like the child support network I was gifted with as a young single mom, made up of sage advisors, friends who babysat regularly (or with whom I swapped regular babysitting) so I could work, friends who would drop everything to come get the kid if I had an emergency, and the kid's dad who gave me big chunks of time off. In that case, the connection to me (and the kid) was what was relevant - whether or not any of them knew one another didn't really matter. There was no larger purpose than helping me out or enjoying my kid. This is the type of network that 'networking' tries to build and leverage. It is often based on direct reciprocity (I scratch your back, you scratch mine), is personally maintained (I work to maintain the relationship - stay in touch, send gifts, etc. ), and often requires a direct match between my needs & yours - if there’s no direct match, there’s no relationship. (i.e. if you can’t help me raise my kid, I have far less reason to sustain our relationship, given my limited time and energy). And it's often homophilic ('like attracting to like') or relatively homogenous. My kid-network consisted entirely of older-moms, current-moms, wanna-be moms & one dad. An Eco-Network is a relative newcomer to the network-science labelling game. I don't even know where I got the term from. It's not in the book I pulled the others from, which is what I'd expected. I know I've come across it in a few places over the course of my network reading but haven't been able to re-find them - so if anyone reading this can find them, please share with us! In any case, an eco-network sits somewhere between a socio-network and an open-network. A socio-network (the 'network in a box') generally has a centrally defined, narrow purpose (think 'mission statement' or 'avoiding organizational bankruptcy'); a clear & precise definition of inclusion (think 'everyone on our payroll' or 'the roll-call list'); a relatively centralized & hierarchical command system; and officially-sanctioned & controlled information and resource flows (balanced by secret, un-sanctioned information flows). Whereas an open network is unbounded, random, directionless and incoherent (think Twitter, FaceBook, Instagram). So we could think of an eco-network as skirting the boundary between rigid pseudo-control and a free-for-all. In my mind, an eco-network is the social equivalent of that strange attractor within a system that generates ordered patterns out of chaos. To me, an eco-network has the potential to generate a collective path from our current world - a world presently oscillating between destructive authoritarian rigidity and chaotic collapse - to a new world, built on an evolved understanding of order/structure, connection, and thriving. For another - in both cases, flows of resources (whether money, information, skills, trust and shared inspiration or nutrients, shared environmental context, water and sunshine) are complexly reciprocal, as opposed to transactional. In a forest ecosystem, no-one barters with the squirrel to get it to poop out worm & fungi food. And in exchange for the squirrel poop, worms & fungi don't break the elements down fine enough so that plant roots can absorb them because because the trees or the pooping animals pay them to - they do it because that's what they do, it's part of their organic process. The trees & other plants only grow if there are adequate nutrients and water - and when they do, they create food some of the animals need to survive (and poop out), some of which become food for other animals, and it all requires water, water retention, healthy soil - and so on. There is an organically-driven flow of value, based on adequate diversity, that is not directly transactional. There is no need for direct transactions because each community member's survival depends on the in-flows (food, etc.) and out-flows (poop, etc.) of all the members. Transactions are too small a dynamic to support the complexity and adaptivity of an ecosystem. In an ecosystem, there is also no 'boss', no centralized command & control. The whole thing works because of how the community fits together, not because someone designed it that way. A social eco-network is similar. There may be players with larger impacts and greater input into direction, but that doesn't mean they master-mind and control the whole thing. Another thing a social eco-network and a ecosystem have in common is boundaries. They may be fuzzy, but they are real and discernable. For instance, there is diversity, but the diversity isn't infinite (like it could be in an open network) and it certainly isn't random. Whales don't occupy forests, butterflies don't do arctics, polar bears don't co-exist well within rainforests. So - ultimately - the main distinction between an ego-network and an eco-network is this - the eco-network exists to support a purpose, not a person or an organization. It supports a broad purpose that is greater than any of the individuals involved, but which benefits all the individuals involved. It's also a purpose which can't be served nearly as effectively by individuals (or individual organizations) acting on their own, without the diverse & reciprocal flows of support and information that characterizes an ecosystem. The glue, then, is not ONLY strong personal bonds (as in an ego-network) - tho it won't ever work without a lot of them - it is ALSO an intention that is larger than the personal bonds. It is an intention to be one part of a larger, purposeful, whole. An intention to help develop that whole and the individuals within it in ways that are generative for oneself as well as for the larger purpose. 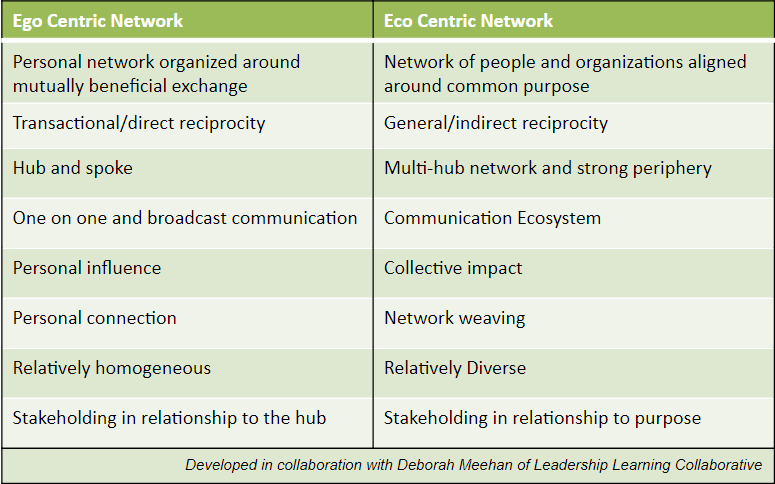 An eco-network, then, has: a purpose; diverse membership; complex reciprocity; multiple 'centers' with multiple roles; and a robust and free flow of information, resources, capacity and care to where they are needed most. A flow that both includes and transcends the bonds of personal connection, and that emerge from the interactions. Far from being a popularity contest, an eco-network is a puzzle we can do together. It’s a fun but serious game of learning about fits and flows - about how to amplify the impact of what each member has to offer. It’s a dance between the individual and the collective, an ever-shifting experiment with order emerging from chaos. I believe it matters because our imaginations matter. All of our actions and behaviors are driven by and reflect our deepest beliefs and values - and these are all gestated in the womb of our imaginations. What we can't imagine, we can't create. And the only way we ever create something new, for which there is no current model, is if we imagine it first. I believe it matters that we pull our imaginations a step past what we already know, do & envision - into a higher level of generative capacity - in a way that affirms and includes everyone, not just the social butterflies. Is not a contest - it's more about discerning the right network for ourselves (so we don't end up like a polar bear in a rainforest), finding our natural place, supporting the flow of nutrients where they need to go, expressing our unique contribution & helping others do all of that as well. Means supporting others, whether they're able to support us or not, serves the overall purpose we’re all trying to promote. Stimulating this kind of understanding & imagination requires many tools & approaches - Mapping is the tool Tim & I personally contribute to the puzzle. Powerful, adaptive eco-networks are the shift we're trying to support. What contributions are you interested in making & to which greater purpose? I've been attempting to build a "network of purpose" since 1993 focused on the ecosystem of people and organizations who need to be involved in helping kids born or living in high poverty neighborhoods move through school and into jobs and careers by mid 20s. The web library includes a directory of nearly 200 Chicago youth tutor and mentor organizations with an additional 2000 plus links to research showing where and why such programs are needed, articles showing resources people can use to build and constantly improve needed programs, and links to ideas about process improvement, innovation, mapping, visualization, collaboration and network building, such as yours. I have defined my network around "purpose" since forming the Tutor/Mentor Connection in 1993, but also around geography, using GIS maps of Chicago to show all of the high poverty neighborhoods where kids, families and schools need extra help from a wide range of stakeholders. To me building a network and connecting people and ideas starts with building a list of who is already involved in some way, then using what ever communications tools are available to try to connect one with another, and myself with as many as possible. I've been writing a http://tutormentor.blogspot.com blog since 2005 and nearly 190 articles are tagged "network weaving, network analysis and networking". I hope to connect with you and others who do this work. Great article Christine. Thank you. Your writing resonates with the work we have been doing in a group within the Teal for Teal network / community we have come to call Platwerk (platform and network). The term eco-network as such I have not seen before. I did hear about eco-systems in an organisational context in Otto Scharmer's work Leading from the Emerging Future. Almost at the same time I came across the term meshworking (as a weaved network) in the work of of Anne-Marie Voorhoeve and the Center for Human Emergence. And as I understand it, CHE takes much of the terminology from Don Beck and Margaret Wheatley and the Birkana Institute. … I could go on but I'm sure you use those sources as well. I'm happy you are introducing 'imagination'. I agree this is very important. I do question myself why these subjects have not received much attention (yet)? Thank you Christine for putting this in the context of an ecosystem which makes perfect sense to me. May I share giving you credit please? I'm putting together a workshop idea with ecosystems as the educator. Spencer, be my guest! Glad you find it helpful. Love this post, Christine! I have been saying to various groups something along these lines, that networking and network weaving are different mainly because it's not just about making you the hub. That does not support overall resilience, sharing, and other network effects. If what we want to do is support regenerative capacity, then let's weave away in smart and generous ways. This is so wonderfully robust! I like calling out the difference between eco and ego-networking. Will be sharing with others for sure! Curtis, you write so much that is so useful to so many at http://interactioninstitute.org/author/curtis/ – I'm honored to be able to contribute something useful to you! Lovely article, well said. I particularly liked this statement: "And the only way we ever create something new, for which there is no current model, is if we imagine it first." I think your mapping tool is helping people to imagine and really "see" their own eco-networks. Thank you Amy! We’re still all learning together how to stimulate that imaginative shift. And I at least hope that mapping is ane part of that. This post is music to my ears! Thank you, Christine, for so clearly articulating the difference between networking and network weaving.